Portland is Maine’s creative hub and home to some of the best restaurants, bars, and breweries anywhere. Those cobblestone streets winding through the eclectic seaport also lead to boutiques and other independent shops teeming with next year’s trends and yesteryear’s fashion. Shoppers short on time should stick to Congress Street, but venturing further afield toward the waterfront will offer more singular choices. 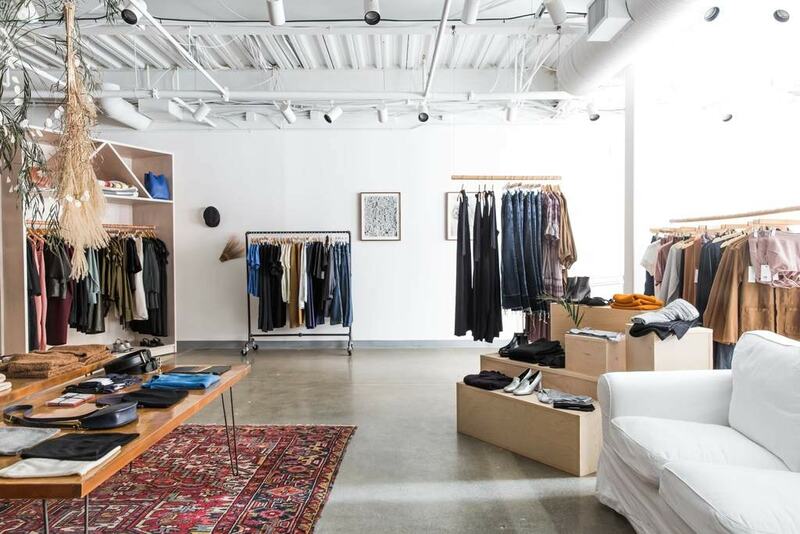 A women’s high-end “concept” clothing store, Judith has sold carefully curated hats, clothing, and accessories since it opened in a bright, brick-and-mortar storefront in 2014. The store has an art gallery feel—white walls, minimalist displays, and open spaces—and skilled artisans and designers craft the clothing. Offering bespoke neck and bow ties, Bowline Co. is the brainchild of Portland fashion entrepreneurs who already owned separate bag and belt shops. Whether they’re upcycling L.L.Bean flannel pajamas or using grey linen, green cotton or fluorescent yellow (“First Responder”) cloth, each item is made from scratch in their shop. Each name is tied to a specific place, and as you might expect, the Northern towns known for their wildlife are plaid or hunter orange. Distressed leather, beeswax linen, and waxed cotton—Rough & Tumble is a designer bag store for professional men and women who want a rustic chic look. It’s not just handbags, messengers, cases, and totes: the company has moved into shoes and boots, as well as jewelry cunningly crafted from driftwood and Maine gemstones such as tourmaline. Revivalists, rejoice: Portland’s vintage clothing scene shows no sign of letting up. That’s in part thanks to this consignment shop, thoughtfully curated with vintage blouses and beloved brands. A short walk from Portland’s Museum of Art in the middle of shopping haven Congress Street, the shop draws from a bevy of indie store owners, artists and wannabe artisans alike. A shopping mecca for lovers of vintage threads and vinyl, Moody Lords is among the best indie shops in Portland, with a variety of sequined dresses, tasseled boat shoes, retro bathing suits, ’90s crop tops and even cassettes for your wood-paneled station wagon, to name but a few. At Moody Lords, come for the clothing, but stay for the obscure Christian vinyl records. A permanent flea market featuring 80 vendors selling mostly Maine goods and clothing, Flea-For-All features everything from bespoke garments and luxuriously battered boots to hand-blown glass. Weekend hours, limited space, and a curated selection all make this vintage shop a hot spot for the fashion-focused, but it’s also an easy stop from Portland’s restaurants for a post-brunch schlep. The shifts and skirts run from kitsch to vintage, with plenty of heels, flats, blouses, relic ’90s T-shirts and formal black lace gowns for whatever the occasion calls for. If Little Ghost Vintage always seems to have good stock, that’s because its owners scour New England and keep items—including wigs seemingly taken from the heads of pinup models—moving in and out on their Etsy page.